Today’s story takes us into a Polish swamp where we find a strange savior for a fleeing Unitarian theologian and his family. There may or may not be a fairy involved. The story was lengthily prefaced in The Spiritual Magazine of January 1874 by an explanation of the expulsion of Unitarians from Poland after their persecution by the government. (The Spiritual Magazine blames the Jesuits. As one does…) While The Spiritual Magazine and The Monthly Repository were most interested in the mysterious workings of Providence, I wonder about the nature of that Providence and its relation to the kingdom of the Fae, rather than the Heavenly Kingdom. “Samuel Crellius wishes happiness to H. V. O. “I will to gratify your desire communicate to you in writing the remarkable event which you listened to with pleasure. When my father, Christopher Crellius, with other Unitarians, was driven from Poland, in the year 1666, he became acquainted in London, with a pious woman, who was instructed by John Biddle, and was called Stuckey…This woman spoke to my father in this manner—“ You, my dear Crellius! wander now an exile, in poverty—a widower—burthened with four children; give me two of these, a son and a daughter, in England, and I will take care of their education.” My father thanked her cordially, and promised to consider it. When returned to Silesia, he consulted his friends on the subject, and departed with his eldest son and daughter in the year 1665 from Breslau, through Poland towards Dantzic, to embark from there to Holland, and so to England. This voyage my father undertook with his own waggon and horses. His driver was the pious Paul Sagosky, from whom I heard an account of the event in Brandenburgh, Prussia, the year 1704, when he was far advanced in age. It was afternoon, the sun declining to the west, when my father, only twelve Polish miles from Dantzic, reached a tavern in which he resolved to tarry that night, because he saw before him a large wood, which he could not pass through by daylight, and he deemed it unadvisable to enter it towards night, uncertain if he should find another house, and moreover, was not well acquainted with the road. They stopped then at the tavern, and brought the waggon into a large stable, and fastened the horses to the manger. The landlady, her husband being from home,received them with civility. She gave orders to take the baggage from the waggon, and bring it into the inner room, where she invited my father with the children to the table. Meanwhile, the driver, when he had fed the horses, explored the spacious stable, not forgetting to scrutinize with careful anxiety every corner, because the taverns in Poland, at such a distance from cities and villages as this was, are seldom a safe refuge for travellers, and there is always apprehension of robbers and murderers. In this search he discovered in one corner of the stable a large heap of straw, of which he moved a part with a stick, when he perceived that this straw covered a large hole which emitted an offensive smell, while the straw was tainted with blood. On this he directly returned to the inner room, mentioned to my father in secret what he had seen, and saying that he doubted not that the landlord was a robber and a murderer. “My father left the room directly, and having verified the fact, ordered directly to bring the baggage again on the waggon, and harness the horses. “When the landlady observed these preparations, she shewed her surprise, and dissuaded my father to proceed on his journey through such a large wood, in a cold night, with two young children, and engaged that she would endeavour to render his stay as comfortable as it was in her power; but he replied, that something very interesting had struck his mind, which rendered it impossible for him to remain there, and compelled him to proceed on. He thanked her for her civilities, went with his children into the waggon, and departed. “When they were arrived in the wood, they met the landlord driving home a load of wood, who accosted my father, “Sir,” said he, “I beg of you, what moves you to enter this wood, so large and extensive, and cut in two or three cross roads, in the fall of the evening; at the approach of night, I doubt not that you will lose the right road, and remain in the wood during the night. You endanger your health, and that of these young children is in jeopardy; return with me to my tavern, there you may refresh yourself and your horses, spend the night comfortably, and continue your journey in the morning.” My father answered that he was obliged to proceed on his journey, however unpleasant it was. The landlord urged his entreaties with greater importunity, and approaching my father’s waggon, and taking hold of it, he renewed to dissuade a further process, with a lowered brow and a grim countenance, and insisted that they should, and must return; on which my father ordered the driver to lay his whip over the horses, to disengage himself from the dangerous man, in which he succeeded. They then proceeded on. My father, sitting in the waggon, sent up his prayers in an audible voice unto his God, as was his usual custom in his travels, and recommended himself and those dear to him, in this perilous situation to his providential care, in which devotion he was accompanied by the driver and his two children. Meanwhile the sun was set, and increasing darkness prevailed; they lost the road, entered a deep swamp, in which soon the waggon stuck, the horses being too fatigued to draw it out again. My father and the driver jumped from the waggon in the mud, strengthened every nerve, and animated the horses with words and the whip, but all in vain; the waggon could not be stirred one single inch. My father became apprehensive that he must pass the night in that dreary spot, and that he or his driver should be compelled to leave the wood next morning and search for assistance, in the nearest village, without even a prospect of success; meanwhile nothing was left him but silent ejaculations to his God. “After having covered his children as well as he could, and secured them against a rigorous cold night, he walked to a little distance from his waggon, and employed himself in sending up his prayers to his God, when he saw a man of small stature, in a grey or whitish coat, with a stick in his hand, approaching him. After mutual salutations, the man asked my father what he did there, and why he travelled in the night, and especially through such a wood. My father explained to him the whole, and begged him to assist him and his driver to try once more, if, with his assistance, they might draw the waggon and horses from the mire of that swamp, and bring them into the right road. I will try, said he, if I can effect something ; upon which he approached the waggon, and placed his stick under the fore wheels, and appeared to lift these a little; the same he did to the back wheels, and then put his hand to the waggon to draw it, with my father and the driver, out of the mire. He called at the same instant to the horses, which, without any apparent difficulty, left the swamp, and drew the waggon upon solid ground. After this the stranger conducted them into the right road, from which they had wandered, and told them to keep now that road, and neither deviate from it, to the right or left, and when, said he, thou shalt arrive at the end of this wood, you will discover at some distance a light in one of the nearest houses of the village, which you must pass. In that house lives a pious man, who, although it is so late, will receive you civilly, and give you lodgings for the night. My father cordially thanked this man for his assistance and instructions, and when he turned his face from him to put his hand in his pocket and offer him some money, he had disappeared. My father looked towards him and saw nobody. He looked all around, and even searched awhile for him, but could not find him again; then he called, with a loud voice, where art thou, my friend? Return, I pray thee, towards me, I have yet something to say to you; but he received no answer, neither saw he his deliverer again. Surprised and astonished, he waited yet a long while, ascended his waggon, and thanked God for this favour. They arrived in safety through the wood, and saw a light in that house of which the stranger had spoken. My father knocked softly at the window, upon which the master of the house opened it, and looked out to see who was there. My father asked him if he could give him lodgings? He replied, by asking how they came so late, and why they proceeded on their journey after midnight, not far from day-break? My father developed the reason in a few words, and was then amicably received. When at table, my father gave him a more circumstantial account, and asked him if he had ever seen, or known such a man as he who conducted him to the right road in the wood, and of whose countenance and clothes he gave a description. He answered that he knew not such a man, but that he knew very well that the tavern at the other side of the wood was no safe place for travellers. After a while, he looked accidentally to one of the corners of the room not far from the table, where he saw some books on a bench. Taking one of these, and looking into it, he saw it was a book of a Polish Unitarian. This curiosity alarmed the master of the house; but, as soon as my father perceived this, he said to him, keep good courage, friend, I shall not bring you into any difficulty for that book, neither inform against you for heresy, and, to give you more confidence in this assurance, I must tell you that I too am a Unitarian. Then he told him his name, which by fame was known to his landlord, who, now full of joy, was delighted to receive such a guest in his house. My father adored the ways of God’s providence in bringing him to this place. This man was a linen weaver, who, when the Unitarians were banished from Poland, remained here for several years hidden through the favour of a nobleman, the lord of his village, and liberal-minded in religion. He would not permit my father to start next day, but persuaded him to tarry with him a few days more, and treated my father, with his children and the driver and horses, very hospitably. How much of this story of the savior of the swamp might be true? Samuel heard the story from Paul Sagosky, the driver, in 1704, “when he was far advanced in age,” which, of course, suggests that the story might have been improved over the years. There is a charming fairy-tale flavor to the story; perhaps the translator was influenced by the early work of the Brothers Grimm. The murderous innkeeper and his villainous wife are standard figures of folklore and rural legends from this 17th-century version to the Bloody Benders and beyond. Was the small man with the stick flesh-and-blood or a woodland spirit? He certainly was not a Wiła, the lovely wilderness fairy who may lure men to their doom. He disappears in the time-honored tradition of guardian angels and Jesus disguised as a phantom hitchhiker. 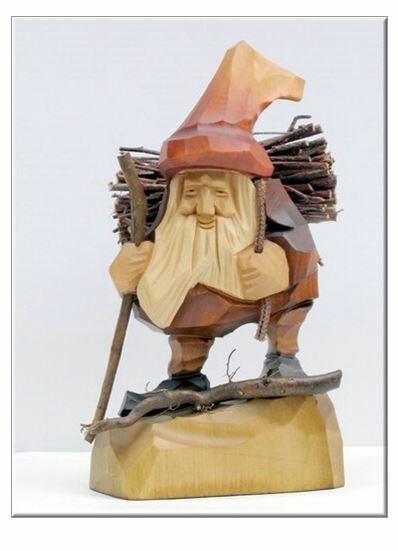 Perhaps he has more in common with the gnomes, a Skrzat or Krasnal? The narrative is ambiguous about whether his stick was a magic wand with powers of levitation or whether he was merely clever with a lever. 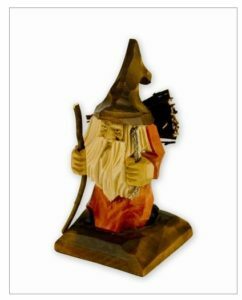 As I was looking for Polish woodland spirits, I ran across the story of the Gnomes of Wroclaw. They were used as symbols of anti-Communist protest beginning in 1981. I suppose it is a bit of a stretch to say that, back in the 17th century, a man of small stature also took the side of an anti-government outlaw. Although some fairies are said to be Catholic, and others fret over their chances of salvation, most appear to be indifferent to religion. So how did the mysterious man know to send the family to a Unitarian household?